Interested in the Sacred Path Men's Retreat?Then Watch this video to get a glimpse into the magic that happens when you bring good men together. We give you the permission to be however you need to be. We celebrate your masculinity, your vulnerability and encourage the strength to dig deep and find your true self beneath your pain. We are a group of men just like you who probably want the same thing you do: Joy, Less suffering, Better relationships, A happier life, A partner. The Sacred Path Retreat is a 4-day experience set in a supportive environment where you can connect with your authentic self within a context of honor, acceptance and understanding. This event will take place on a mountaintop overlooking the coastline, beyond the Malibu city limits in Ventura County. Food and lodging are provided. An enriching experience is promised. An adventure of self-discovery is guaranteed with the assistance of Retreat leaders Dr. Stephen Johnson, Executive Director MCLA and the staff of the Sacred Path Wisdom Council. 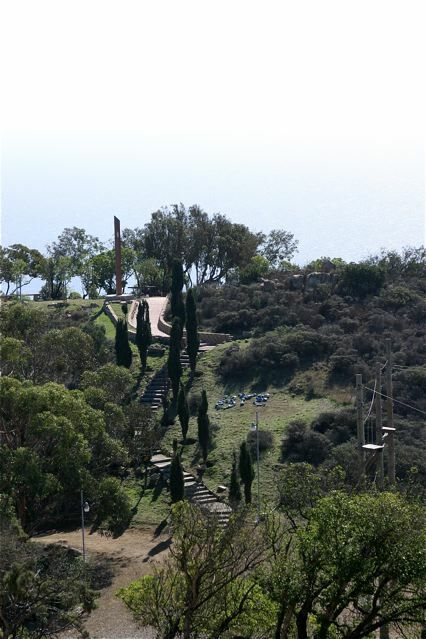 The retreat facility is located north of Malibu in a unique facility on a coastal ridge 750 feet above sea level, providing a spectacular view of the ocean and the surrounding hills and canyons. In the ocean view dining room, dinner is often interrupted by a particularly beautiful sunset. The gourmet meals provide a varied menu for non-vegetarians as well as vegetarians and the cuisine elicits rave reviews.This sacred place offers a profound sense of seclusion and intimacy. The surrounding hills and canyons provide great opportunities for inspiring hikes and nature walks or wonderful spots to just sit and meditate. The rustic cabins, nestled on the hill, offer views of the canyons and accommodate six to eight men. Each cabin includes single or bunk beds, separate showers and bathroom facilities. There are a limited number of private and semi-private rooms available upon request. An opportunity to be heard and to heal. Time to relax, rest, reflect and revitalize. The freedom to shake loose, let go and energize. Encouragement to stretch, take the step and make the leap. Time to be together and time for solitude. Opportunities to explore your psyche in large & small group formats. OUR SACRED TALKING STICK, WHICH STANDS OVER 5 FEET TALL WITH HAND CRAFTED HAND-CARVED POLAR BEAR HEAD. IT IS USED FOR COMMUNITY DISCUSSION, RITUAL AND CEREMONY. There are those things that cannot be described, only experienced. There are those experiences that transform your life. There are those transformations that come from not only what you receive from the experience, but also from what you bring to it. The Sacred Path is one of those experiences! Why should you consider this retreat? Imagine arriving on the "hill" on a thursday at 5 pm and a group of men, whom you have never met, somehow seem familiar. It's as if they know you already and vice-versa. They are your brothers, kindred spirits and confidants. The connection is instantaneous and you will continue to ask yourself: "where have these amazing men, my brothers, been all of my life?" The Wisdom Council is a group of men, dedicated to the Men's movement, especially through the Men's Center of Los Angeles. This group of men, while on retreat, will reach out, assist you, and help transition you in your journey. The council members are not only facilitators, they are individuals just like you, walking similar steps, who have traversed similar paths before. When was the last time you truly honored yourself? When was the last time that you really listened to what was calling you from the inside? You are not alone. We all suffer in one way or another. Men love to pretend that we are good by ourselves. Maybe we are ashamed to ask for help. Remember, even the Lone Ranger had Tonto! We are here for you!